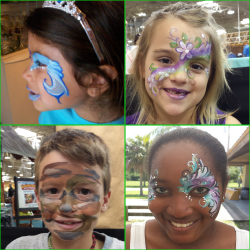 Face Painting Fun for all ages! Let us help you create the perfect party! Princess theme? Pirate theme? You name it and we can transform little faces into masterpieces! We use only top notch approved Face Paints that are safe and non-toxic and can set up a face Paint area inside or out to make your event extra special! Call today for available dates and pricing!